Without efficient forklift operators, any workplace would literally grind to a halt. Warehouses, ship yards, terminals, retail distribution centers, you name it – take away forward-thinking forklift use, and nothing would get done. The same thing applies to lumber yards. With the growth of big box retail stores in recent years, lumber yards have enjoyed a strong resurgence – especially in the public eye. Go to any Lowe’s, Home Depot, or other home improvement store, and the lumber yard is hard to ignore. Optimal lumber yard efficiency is simple to envision, yet sometimes difficult to implement. Yet many of the same smart management methods used in similar commercial settings (including warehouses and other workplaces that use forklifts) are applicable to lumber yards. Sure, there are specific logistical concerns and other unique challenges, but the main ideas are the same. CertifyMe.net takes the same approach with forklift training. Our OSHA certification courses are effective across multiple industries and business sectors. Whether you manage a lumber yard or any other setting with forklift drivers, we’re the best option for affordable, effective online training. It all starts with a positive, productive vision. That’s why our customers keep coming back for compliance training. So how does that vision apply to effective lumber yard management? Customers come first. Every lumber yard should have attentive, friendly staff (including forklift drivers). Many lumber yards have pedestrian accessible areas, where customers can review and inspect product before purchasing. Ensure your lumber yard fosters a customer-friendly experience, and efficiency will soon follow! 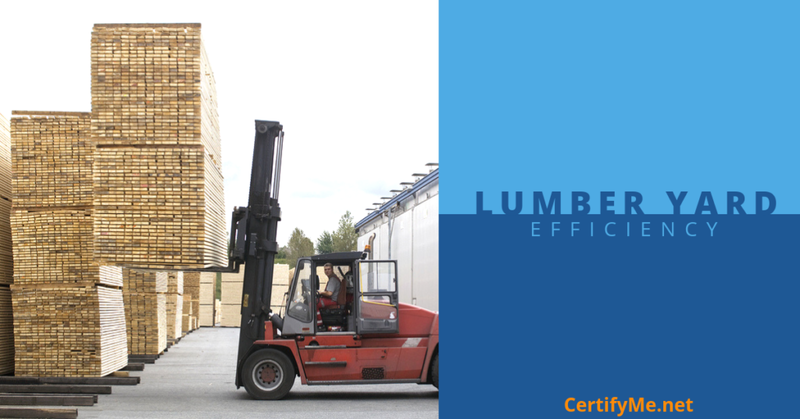 Training is the foundation for lumber yard efficiency. Optimal inventory management and superior customer service are a given. But here’s a crucial third goal to keep in mind: training is the one building block for lumber yard efficiency you can’t do without. This means a well-trained workforce (forklift drivers, management, and everyone else), training on new product releases, and much more. Speaking of which, CertifyMe.net is the preferred training provider to ensure lumber yard forklift drivers are OSHA compliant and ready to perform right away – safely and efficiently! With these goals established, efficient lumber yard management is easier to implement. But you still have to go out and implement your strategy based on a defined set of principles. Know your target market. Define your customers, and everything will fall into place. Is your lumberyard targeting the home improvement demographic or commercial builders? Perfect your product line. There’s a fine balance between variety and too much variety. With your target market defined, it’s easier to determine what types of products to offer. Lumber accessories – nails, hardware, installation tools, etc. – are usually a smart addition to lumber yard inventory. Out-promote the competition. Marketing as an efficiency-focused strategy? Sure, why not? On-point promotion not only drives more business, it drives the right kind of business (assuming you’ve properly identified your target market). Think of advertising as a way to “firm up” your business model; with an honest, upfront, and aggressive marketing campaign, you’ll ultimately cater to clientele that need (and want) your products. Sign Up With CertifyMe.net: Take Care of Your Compliance and Training Needs Today! Speaking of personal, trustworthy & professional…that’s exactly the type of training assistance to expect from CertifyMe.net! Our team knows the ins and outs of OSHA, and we keep our training content constantly updated as regulations change. In addition, we’re here for your initial and recertification needs. Whether you need to train new employees or retrain veteran forklift drivers, CertifyMe.net has everything you’re looking for with an OSHA compliance and training partner. Register today and experience a professional, efficient training experience with the forklift training pros at CertifyM.net. Best of luck with your lumber yard management – with our training, a more efficient lumber yard is only a few clicks away!